One major source of fascination in the bird world is the diversity in plumage coloration, frequently within the same species. 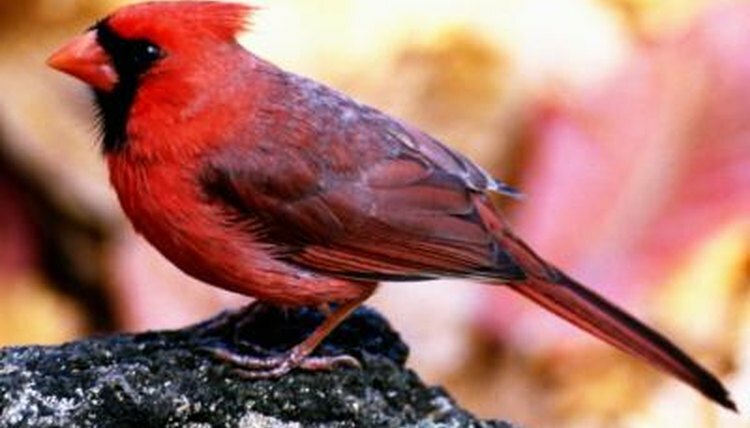 Northern cardinals (Cardinalis cardinalis), for one, exhibit different color schemes based on their gender and general age bracket. Northern cardinals are rather large songbirds found abundantly throughout North America. The plumage of adult female northern cardinals is mostly light brown or grayish-brown. The lower parts of their bodies are more of a light yellowish-brown. They also feature hints of crimson coloration on key parts of their physique, namely the tops of their heads, tails and wings. Although most of their bodies are a brown color, their faces often display markedly darker, almost blackish coloring. When considering color, adult male northern cardinals are significantly more bold than the ladies of their species. The males have intense red feathers on their bodies, with the contrast of black coloration on their faces. The obvious, instant difference in plumage coloring is one of the primary components of the species' sexual dimorphism. Although mature males are red, the coloring is slightly more low key and lackluster over their wings and backs. Adult specimens of both genders are equipped with conical reddish-orange beaks. Until young male northern cardinals attain maturity, they closely resemble fully grown females of the species, with predominantly brown plumage. The male youngsters' brown feathers, however, usually are deeper in tone than those of the older females. Another key coloration difference between young male and mature female northern cardinals involves the beaks. Youngsters of this species don't have colorful beaks, but rather blackish-gray ones. This also applies to the young females. When the males reach about 12 months old, they usually begin molting and making the transition to their next color phase -- red. Young female northern cardinals have brown bodies, but with the absence of any red elements over their tails and wings. Although it might not seem entirely fair that female northern cardinals have less jazzy plumage than the males of their species, it actually serves a useful purpose. The less noticeable a female northern cardinal is, the easier it is for her to remain under the radar while nesting and caring for her offspring. If a predator doesn't see a female, then he won't go after her. The striking red of the male plumage is hard to miss, after all.